The basic principle of the mode of action of the L.I.F.E. System device is the following: The L.I.F.E. 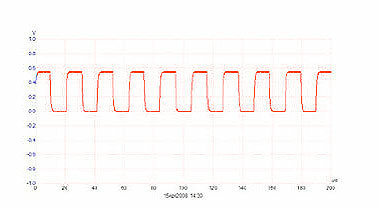 System device sends a square wave signal with amplitude of 5 Volt, and a duty cycle of 50% to the head, wrist and ankle bands. The frequency to be applied, for determination of our test, is about 47.3 kHz. 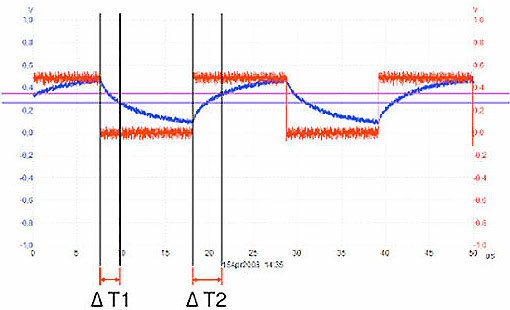 The measurement current through the body is limited to a maximum of 10mA, but usually 5mA or less. Figure 1 below shows the applied signal, without the harness (the head, wrist and ankle bands) being in contact with the human body. Superimposition of the signal without harness being applied to the human body (red signal) and with electrodes being applied to the human body (blue signal). The mathematical calculation algorithm takes input information on the one hand, which is stored in the Element database, and on the other hand the digitized measurement data, belonging to the element. After quantifying the values, artIfacts (like disturbances caused by EMC, movements, etc.) are removed. The cleaned data is sampled and after that, the correlation is calculated, leading to the desired reactivity value, providing the results of reactivity testing, relative to the given element. ΔE = h Δf (h = Planck constant) gives the impression that the energy of the fundamental-oscillation of a vacuum oscillator is frequency dependent and quantized. As a consequence, energy can only be absorbed or emitted in determined portions. The basic frequencies are calculated following the approach known in literature as “global scaling”. The formula for continued fraction was developed by mathematics for approximation and description of natural oscillation phenomena as a mathematical function (Euler-Lagrange movement equation). Table 5: Euler-Lagrange movement equation for describing natural oscillation. The natural frequency of the proton is about fp = 1.4254 x 1024 Hz being a natural constant value. In a spatially limited medium, natural-oscillation can only arise when the interval between oscillating nodes stands in a simple proportional integer-number relationship to the size of the space. This also affects the proportional relationship between base, upper and lower frequencies (modes). Resulting mathematically from this is a logarithmically fractal construction of the natural-oscillation mode. Using the above mentioned formula leads to set of frequencies that will be placed in a node. The node is derived from the natural oscillation of the proton. The fluctuation of the protons is at a maximum in such nodes and therefore the system is “unstable” indicating an abnormal condition in the area of interest. The respective frequencies related to the individual abnormal situation were derived empirically and validated by a clinical investigation. The best measurements can be made where a node is placed, as there is the highest density of matter, a high spectral density, and turbulent oscillations. The frequency of about 47 kHz as used for the measurement with the device L.I.F.E.-System was chosen as it represents the highest density of protons which facilities the measurement. Literature in peer reviewed journals describing the mode of action and effectiveness of the L.I.F.E. System was not available prior to the development of the L.I.F.E. System. Consequently, a clinical investigation giving evidence to the effectiveness was undertaken in 2006. The complete documentation and the results have already been submitted to and approved for European Class 2-A Certification.